Coppia Ferrarese: Coppia Ferrarese is a type of sourdough bread made with flour, lard, olive oil, and malt, and has a twisted shape.It was first made around the 12th century in Ferrara, Italy, and has PGI (Protected Geographical Indication) status under European Law. According to the legend, the host of a dinner to honorthe Duke of Ferrara, had these interwoven breads with typical horns served to allude to some of the duke’s personal adventures. Note: The leaven should be prepared at least 48 hours in advance. Take 200 g of flour in a bowl. Add some lukewarm water, a teaspoon of oil and a teaspoon of honey to the flour. Mix until smooth mixture is formed without lumps. Shape the flour mixture into a ball. Place the flour ball into a bowl. Cover the bowl with a damp kitchen towel. Leave the flour to rest for 48 hours, to ferment. Add a few teaspoons of lukewarm water, knead again, and cover with a damp kitchen towel once more. The leaven should be refreshed every week. Place all the ingredients for the dough into a heavy duty mixer. Turn the mixer on and knead for 15 to 20 minutes. Transfer the dough to a worktop or flat surface. Divide the dough into balls with a diameter of approximately 5 cm. Note: In Ferrara, special rolling pins and other accessories are used to roll and shape the bread. To shape the manually, roll out each ball on floured surface into strips approximately 30 cm in length. Use the palm of your hand to press the dough like the one for strudel, while rolling it into cone-shaped horns. Braid couples of such rolls together to obtain the characteristic shape of the couples (four cone-shaped horns interwoven in the middle). When shaped, transfer the couples on a wooden board. Cover the couples with a wet kitchen towel. Let the couplesrest for 1 hour to 1 1/2 hrs. Bake the couples till golden brown. 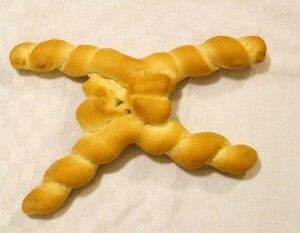 Remove the Coppia Ferrarese from the oven, and slide onto a wire rack to cool. Coppia Ferrarese is ready to be served.